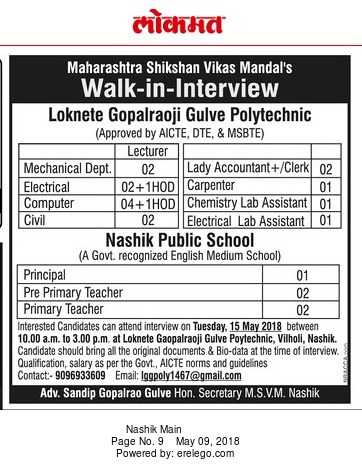 Loknete Gopalraoji Gulve Polytechnic, Nashik has advertised in Lokmat newspaper for the recruitment of Lecturer jobs vacancies. Interested and eligible job aspirants are requested to appear walk in on 15th May 2018. Check out further more details below. About College: Adv. Mr. Sandeep Gopalraoji Gulve started the institution with fulltime 3 years Diploma Courses i.e Mechanical Engineering, Civil Engineering, Electronics & Telecommunication Engineering, having intake capacity of 60 students in every stream.